now playing in streaming video. Watch the same film used to familiarize P-51 pilots with the Mustang fighter during World War 2. The P-51 checkout shown in our video, full screen & full bore. * The Fight for the Sky Some of the most exciting, explosive World War 2 air action ever filmed. American fighters are "turned loose" to gain air superiority over Europe. Very hard hitting air-to-air and air-to-ground gun camera footage. 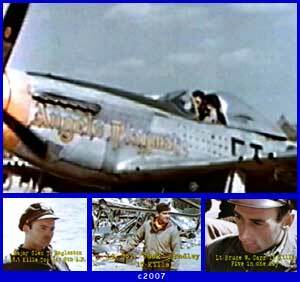 * The 354th Fighter Group "Mustang Pioneers" Color Scrapbook Rare color footage of the legendary 354th Fighter Group, with over 700 Kills, the highest scoring American unit in Europe. You'll see great aces like G.T Eagleston and B.W.Carr and others at work and play -- plus amazing gun camera film-- all in living color. * A Day with the A-36s Rare color combat footage of an A-36 (ground attack version of the P-51) squadron in action in Sicily. See a captured FW 190 & an Italian Macchi 202 too. Exclusive Drive-In version. * Air Attacks Against Italy More exciting "from the cockpit" views of A-36 bombing & strafing runs against targets near Rome. * Bonus Luftwaffe Finis (Color ) Recently discovered color footage of top Luftwaffe leaders & pilots taken as they fell into Allied hands. Startlingly realistic color film of Herman Goering, Adolf Galland, Hans Ulrich Rudel and many more. Captured Me 262. Fw 190 &more. See P-51 performance charts, cockpit photos, systems diagrams and more. These are images taken from original World War 2 pilot & technical manuals. Click here for "P-51 Variants"
In 1940, the British Purchasing Commission approached J.H. 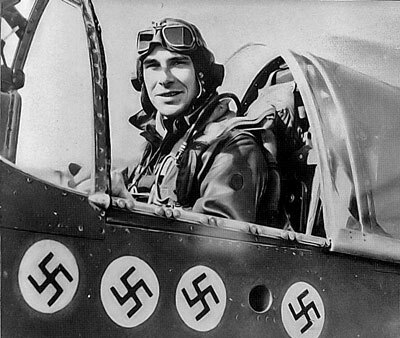 "Dutch: Kindelberger, President of North American Aviation with a proposal to produce Curtis P-40 War Hawks, under license, for Great Britain. North American's designers, Raymond Rice and Edgar Schmued, responded with a counter proposal that they produce instead a brand new airframe that used the same Allison engine employed by the P-40. The British agreed, under the condition that the new prototype be ready in an unheard of 120 days. North American, who had never even produced a fighter before, designed, manufactured and flew the NA-73x (P-51) prototype in a truly amazing 102 days. 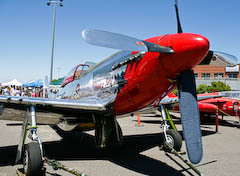 Despite revolutionary features like a laminar flow wing, an under the fuselage radiator that provided additional "thrust" and a slick, aerodynamic shape, the early P-51A models were hampered by the poor high altitude performance and the mediocre top speed of the original Allison engine. Although good low level attack planes, they did not attract much interest on either side of the Atlantic. All that changed when the British decided to test a Rolls Royce Merlin engine (used in the Spitfire) in a Mustang air frame. The rest, as they say, is history. Top speed leaped past 400 mph and high altitude performance was a revelation. The result was the P-51B, followed by re P-51C, both of which featured a Packard built Merlin and the flush patterned cage style canopy featured in our film. It's six 50 caliber machine guns packed plenty of punch and the Mustang's rugged frame could absorb an unusual amount of damage. Though not "easy' to fly and requiring that the pilot pay attention, the Mustang was predictable, with good stall characteristics and was without any really nasty habits. About the only short coming of the P-51D was it's relatively heavy weight, which made it only a mediocre climber up to 20,000'. That deficiency would have been more of a draw back in an "Interceptor" than in the roles the Mustang was designed for, and that fault was corrected in the light weight P-51H, which was produced too late in the War to see action. Ironically, it was the World War II work horse, the P-51D, not the newer "H" model, that saw heavy action in Korea because of an abundance of spare parts.